"It is not the right time for an acquisition certain to increase prices," Healey (above) wrote to new Partners CEO David Torchiana. Boston-based Partners HealthCare, only weeks after it lost an antitrust battle regarding planned acquisitions, is in the crosshairs again, this time from the Massachusetts attorney general, for the planned purchase of a doctors group. Attorney General Maura Healey wrote in a letter to Partners' new CEO, David Torchiana, last week that the health system should halt its plans to acquire Harbor Medical Associates, a physician group with about 70 doctors that operates south and east of Boston. She can't stop the deal in court, but she suspects price increases arising out of the deal would be “significant,” she said. 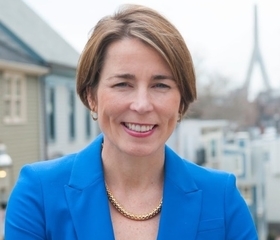 “In the current environment, when the Commonwealth and health care stakeholders should be uniquely committed to restraining costs, it is not the right time for an acquisition certain to increase prices and nearly certain to increase overall costs,” Healey wrote. Healey urges Partners to re-evaluate its expansion plans as she says Torchiana pledged to do in early February. His past statements are inconsistent with Partners' plan to acquire Harbor, she said. Rich Copp, a Partners spokesman, Tuesday said it's impossible to predict the precise price effect the acquisition might have because it has not yet taken place. “We're evaluating appropriate ways to respond to some of the cost concerns that have been raised,” he said. A Partners' acquisition of Harbor would likely result in a permanent Harbor physician price increase of 41.5% for payers, according to a 2013 preliminary report by the Massachusetts' Health Policy Commission, an independent state agency that develops policy to decrease healthcare cost growth and improve patient care. At the time of that report, Partners wrote a rebuttal, disagreeing with the report's findings. Copp said Partners' goal in working with Harbor is to improve patient care in southeastern Massachusetts. A Massachusetts judge decided in January not to approve an agreement between Partners and former state Attorney General Martha Coakley to resolve an antitrust investigation into Partners' plans to acquire South Shore Hospital in South Weymouth and Hallmark Health System, which operates two hospital campuses in the Boston suburbs of Medford and Melrose. That deal would have allowed Partners to take over those hospitals in exchange for not raising prices beyond the rate of inflation through 2020. After that ruling, Healey threatened to sue Partners if it went ahead with its acquisition of South Shore; Partners announced in February it was dropping plans to acquire the hospital. Partners also announced at the time it would hold off on acquiring Hallmark, but it has not yet said whether it will still eventually finalize that deal.